This is not like the original low lather Grow Gorgeous shampoo which required no additional conditioner. I have very dry frizzy hair so I did need to use conditioner as well. Having said that, the finished result was so much better compared to using a conventional shampoo. My hair looked much thicker and stayed looking better for longer! i've used this product a few times now and there seems to be a knack of how to use it to get the best result. you need to rub the product between your hands before you put it on your hair, then when you do put it on you need to smooth it down your hair and massage it into your scalp as if you were at the hairdressers (like how they wash your hair) rather than rub it into one spot like might a normal shampoo which foams and makes it easier to distribute through your hair. you definitely need to use a conditioner after using the shampoo as otherwise hair is a bit knotty and harder to detangle. i've always used it with the grow gorgeous conditioner and my hair has felt lovely and silky aftewards. Last night, I used the back to roots product too before using this shampoo and my hair and scalp felt super clean after using it then the shampoo and conditioner. I haven't really been using this product long enough to know if it's going to help my thinning hair problem, (probably caused by parabens/sulfates in previous shampoos!). It does seem to leave my hair a bit limp and dull (maybe it's the oils in it? ), even though I'm trying to make sure I rinse it well. I like the smell, however. I've been using this product for 1 month. And it works perfect! The hairs are visibly thickker and look exellent. What about smell... It's really very strong ann not everybody may like it. But it doesn't stay at your hairs. And it's not a big problem if you want to have exiting hairs. I got this as part of a set with conditioner and serum at a very good price. The smell is just horrible, very flowery and strong. The shampoo was very drying on my hair, left it like straw. It was also difficult to rinse out. And did I mention the very strong perfume smell. After I washed my hair the whole house smelled like it. It is very strong. A total waste of money. This shampoo makes your hair very sticky and waxy. It's very difficult to even brush your hair and you can see white residue on you hair brush bristles. Maybe just not for my hair. If it helps, they are Indian long hair. I have tried washing it with loads of water but no matter how I wash it, there is always a lot of residue on my hair and they don't feel clean. this shampoo is a godsend because it promises to boost hair density and does so in an easy to use medium - shampoo. If you want to get even scalp coverage of Grow Gorgeous Neutaceuticals than go for the shampoo because with the serum it's very difficult to get even scalp coverage because you can only use 20 DROPS a day to treat your scalp. :-) this shampoo is very thick textured and doesn't lather very easily however for what it promises to do texture is an easy compromise to make. The first time I used this product I considered it to be terrible because it did not wash off and make my hair stick. The next day I was unable to brush. I gave it a 5 star because it is a very very good product if used properly. A very little amount must be used, even if on the label says to use plenty. 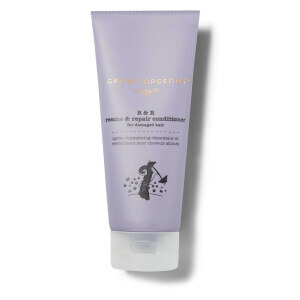 Th product must be used with a lot of water, even when massaging the shampoo onto the hair, a lot of water must be used and so the quantity of product is very little. It must be washed off with a lot of water and then rinsed. After using it for a couple of weeks I can say that my hair has more volume, it does not fall off as much as it used too, and has a very nice shine. Also, my hair does not greasy every two days. Now, I can wash every 3 or 4 days.